Sign Language Interpreters will be provided at 6 performances throughout our 2016 season. Everyone is welcome to attend Deaf Night at the Theatre performances, not just those from the Deaf and hard of hearing community, and for those who have never seen a sign language interpreted theatre event, it is quite extraordinary and an art form in itself. 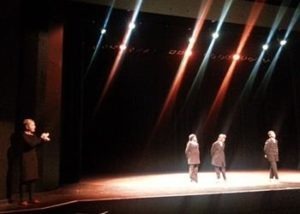 Deaf Night at the Theatre seeks to make the theatre experience more accessible for our Deaf audience. These special events are designed to be more accessible for members of the Deaf and hard of hearing community with interpreters assisting at the box office, concessions, usher stations and then interpreting the performance itself. These type of events bring our community together and are a central part of Act Two Theatre’s outreach efforts. True to our mission, we strive to educate our hearing patrons about the Deaf experience and many patrons express how much they have enjoyed watching the interpreters as a part of their experience. Special Introductory Pricing for our Deaf and Hard of Hearing community to raise awareness with “PAY WHAT YOU LIKE” tickets will be available at the Box Office only for interpreted performances. The Box Office opens at 6:30 pm with an ample block of tickets made available for those looking to enjoy a fun and funny interpreted live-theatre event. Individuals may also choose advance Individual Tickets with reserved seating at our regular pricing on online. How is Deaf Night at the Theatre different? From the moment you enter the theatre, you will see interpreters at the Box Office and providing assistance to our ushers. Our goal is to make the theatre as accessible for the Deaf Community as possible. Inside the theatre, you will see a pair of interpreters bringing the actor’s words to life in American Sign Language (ASL). 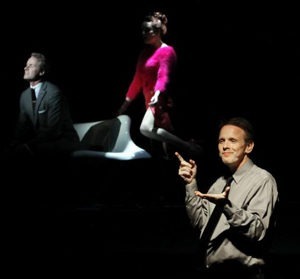 ASL translates both the spoken word and the emotional subtext of the actor’s voice into a physical language. In this way, the experience of the Deaf and Hard of Hearing audiences can be as close to that of the non-Deaf audience as possible. Would your company like to underwrite this program so that it can continue and expand its reach? Contact Paul James at info@acttwotheatre.com for more information.